Well, not personally. But pretty darn close. When it comes to intimidation, few do it quite as well—by which we mean cruelly—as dictators. 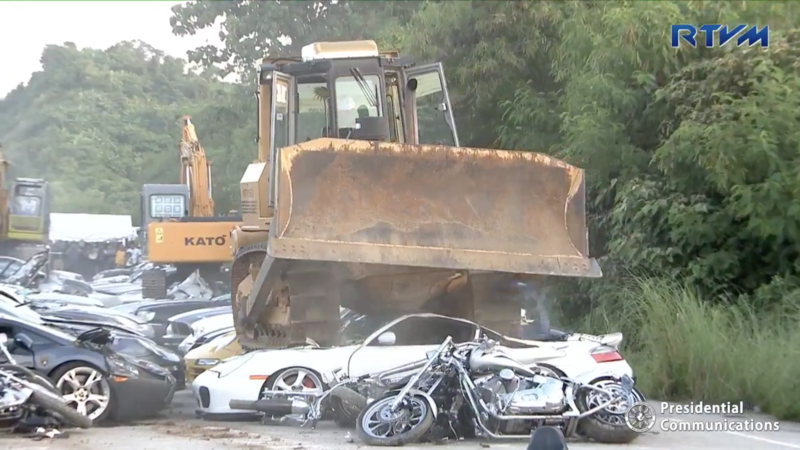 Just ask Philippine president Rodrigo Duterte, who on Monday presided over the crushing demise of what reported amounted to approximately $5.2 million in confiscated automobiles and $340,000 in motorcycles, in what was described as an act of "condemnation and public destruction." 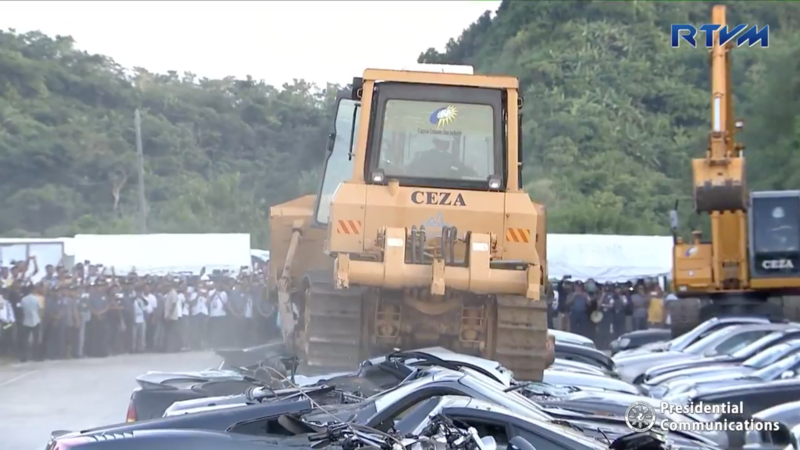 According to the Daily Mail, 68 cars and seven motorcycles were destroyed during the stunt in the northern Philippine port city of Sta Ana, Cagayan. 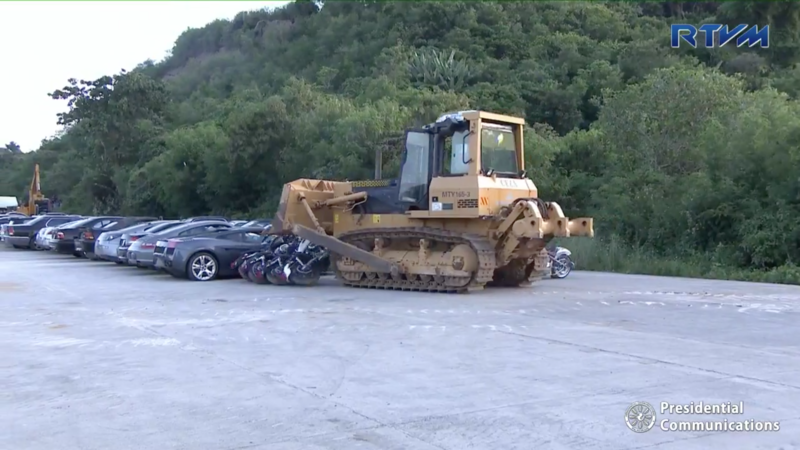 The vehicles were among 800 recently confiscated by customs officials while being smuggled into the country, according to a statement by the president's office. "I did this because you have to show to the world that you have a viable place of investment and business," Duterte said, according to the Daily Mail. "'And the only way to show it is that you are productive and that you have the economy, to absorb the productivity of the population." 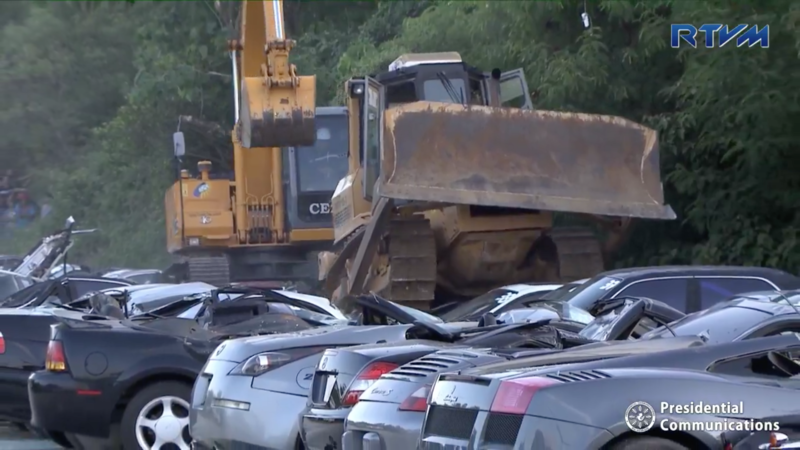 This isn't the first time Duterte has smashed cars in a grand public display as part of what has been described as his anti-corruption campaign. 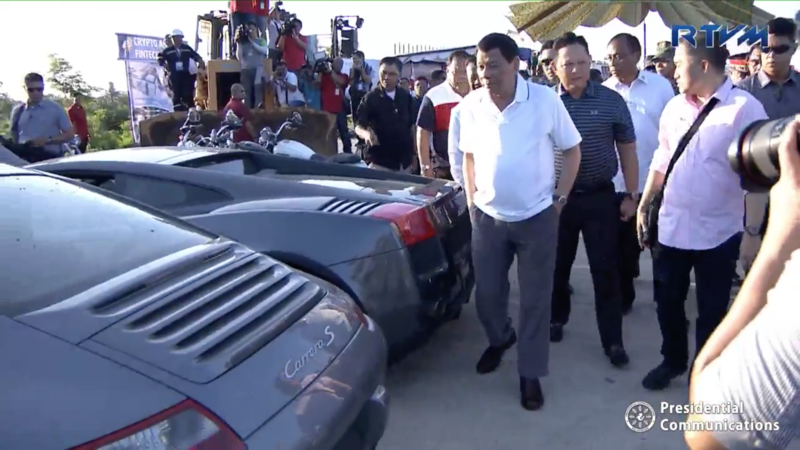 Several months ago, the Philippine president presided over a similar mass crushing of high-end vehicles—a group which, oddly enough, included a C3-generation Corvette and a Ford Explorer. Duterte has become somewhat infamous for his aggressive methods against alleged law-breakers—most notably, his endorsement of vigilante death squads that wantonly murder drug users, small-time criminals, and homeless people, including children living on the streets. During his 22-year stint as mayor of the city of Davao prior to assuming the presidency, human rights groups tabulated at least 1,400 extrajudicial killings tied to said death squads; Duterte also claims to have personally shot three kidnapping suspects to death while mayor. You can watch the whole video, uploaded to Facebook as a live stream by the Philippine government's presidential communications bureau, below. 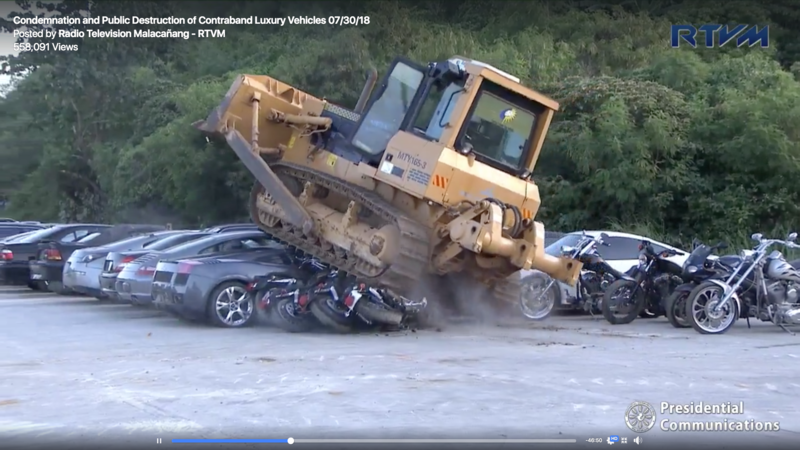 It's an hour long, but if you want to skip past all the setup, the vehicular crushing starts right around the 20-minute mark. Be warned, however: It's a little uncomfortable.